Please help. On Monday afternoon my 7 year old Miniature Pinscher ran away during the thunderstorm. I wasn't home at the time, my partner was. Apparently there was a loud clap of thunder and Agatha bolted out the back door cat flap. She ran around to the side sliding door and banged at it and my partner called out to her to "go round" (we do this a lot and she knows this command - otherwise she would have us constantly letting her in and out!). Unfortunately there was a second clap of thunder and Agatha ran off. My partner assumed that she was going to come around the back however after a couple of minutes he realised that she hadn't come in so went out to look for her. The neighour at the back of our property (we are on acreage) said that he heard a bang at his sliding glass door and saw that it was Agatha but by the time he got up out of his chair and over to the door she had sprinted down the side of his house and across the road into someone else's bush block. Most houses in the area are surrounded by bush and most houses don't have fences (only rural type of farm fencing - which is what we have and what Agatha crawled under). Agatha doesn't like thunder or loud noises but has never run away before or even tried to run away. When we go to off leash areas she always comes back and "checks in" with us before running off to play. Usually if she hears thunder she will come to either one of us to sit on our laps or be picked up etc, she usually doesn't want to go outside at all. So many neighbours said that it was the loudest thunder they had ever heard and a couple of people thought that it was a tree or a plane or an explosion or something crashing into their house. I guess that is what Agatha thought too. Agatha was diagnosed with Tracheitis last Wednesday and the vet advised to keep her collar off her when at home so she wasn't wearing her collar. She is microchipped though and we have reported her microchip number as missing. I came home approximately 15 minutes after this happened and by that stage my partner had been to all of the surrounding neighbours houses and through the bush areas on their properties. My partner started door knocking while I printed up some flyers. We door knocked all houses in the five streets behind us, then dropped flyers in some of the further streets. We drove around calling out her name until my voice got too sore. My partner came up with a good idea to record us calling out her name on his phone and then play it back through the car stereo so instead of driving around with the windows down blasting music we drove around blasting out us calling out her name! We did that until it got too dark then we came home. We got up early Tuesday morning and delivered flyers to the same houses that we doorknocked the night before to let them know Agatha was still missing. A walker told us he thought he saw her in some bushes so went to investigate but it was just a giant hare! We then delivered flyers to another 250 houses in a new estate area a bit futher away but accessed via a bush walking track. We put a large lost ad in the local newspaper and contacted all of the local radio stations. We posted on every lost pets group in the Bendigo area and a few Victorian ones. Someone phoned at 1pm so say that they had seen Agatha in their front yard at about 10am but didn't check the flyer from the day before until a few minutes before he phoned us. He lives approx 1km away from our house. I am pretty sure it was Agatha as he described her as a small fat dog with little legs and a little head (unfortunately describes Agi). My parents, sister, a couple of friends, some neighbours, my partner and myself continued to door knock and walk through the area. I took my other dog and let him mark plants and trees hoping it would lead Agatha home. Last night I had a phone call that someone thought she might have seen Agatha along a creek trail approx 6kms away. That would be 6 hours after she was sighted so close to home. Is it possible that Agatha would have gone that far? It was 35 degrees yesterday. We did more door knocking/walking the streets/delivering flyers until dark. 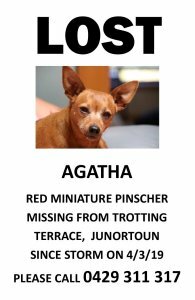 Last night I registered Agatha missing with a company called Lost Pet Finders and they sent out automated telephone messages to all landlines in my area. The only responses that we have gotten from that have been people calling to say don't give up and to share stories of how their pet was missing for some amount of time and then was found. We printed and delivered another 200 houses today plus walked up and down all of the streets in our area - took hours! I just feel like I need to be doing something else but I don't know what. Someone in the US asks if there are dog tracking dogs that you can hire as that is how she found her missing dog 6 days later. Does anyone know if anything like this exists in Australia? There has to be something else that I can do, right? I am going crazy being at home, yet exhausted from two sleepless nights. It has been over 48 hours since Agatha went missing. Should we continue to expand our letter box drop area each day? Or do we go back and redo the closer areas in case someone missed the first flyer or is just keeping her? I am so lost. I'm so very sorry. I can only imagine how distressed you must be and it sounds like you've exhausted every avenue open to you so far. With the RSPCA, I would at least keep visiting daily if you can, despite what they said. It's not unheard of for a microchip to slip from where it's supposed to be and pound staff to not identify that it's a missing dog based on descriptions left with them. The only thing I can think of, that has worked in a few other cases, is to try and get your story in to the media somehow. People are less inclined to keep someone else's pet when they're all over the news and you may alert people who spot her, who aren't within your poster/letter drop radius. I'm not sure how to go about it but the lengths you've gone to so far to find Agatha might potentially make a reporter more interested in picking up the story.. One of those "let's turn this in to a feel good reunion" type of story for them? I'm so sorry, I wish I could offer you something more. I hope you find your darling girl very soon. Dogs can travel when running in fear . Without knowing your area & state laws look into the possibility of finding someone who can fly a drone with video coverage ,This has been used before to pin point a location .Keep walking logical safe areas ,the creek would have water & be quiet . Dogs generally shut down when scared so your want it emphasized not to chase but to contact you & be prepared for her to not even respond to you . There are groups in Australia that have helped search for dogs lost & are trained in the "understanding" process of a dog in fear and Flight . Thankyou for your replies. I contacted a Pet Detective and they did a profile of Agatha for me to help determine what she might be thinking and doing. They think it is very unusual for a dog to have so many people looking for it and yet to have not had any "confirmed" sightings. Someone else thought they had found her but then it turned out it was a fox They had quite a few other insights and ideas of things that we can be doing. Snook - I have contacted all local media and am just waiting for replies. Some have suggested I purchase a huge ad or a tv ad. I don't know what to do. We have already spent just over $1000 in Facebook paid advertising, newspaper advertising, Gumtree advertising, using Lost Pet Finder SMS and automated landline phone alerts, printing flyers and petrol. It is so hard to know what is a worthwhile means of finding Agatha and it is getting so hard to think rationally. I feel like I would spend any amount of money to get her back . . . I am not sure to what extent my husband agrees. We are contemplating whether unaddressed mail delivery of the lost dog flyers would be worthwhile. DogsFevr - I have been in contact with the local drone clubs/organisations and their specialist search and rescue drones are all in Gippsland for something this week so not available until next week. Do you know of any specific groups that do tracking for dogs? I have been unable to find any and have contacted all of the search and rescue dog organisations in Australia to see if they know anyone who does this and so far the answer has been no. Tassie - Thanks for your suggestion. I have been in contact with the Bendigo Obedience Club and they sent out a message to all of their tracking members and someone has replied that her bloodhound is new to tracking but she will give it a go tomorrow morning. Fingers crossed. Totally distressing - you have covered all bases in getting word out. Many people would never look at lost pet pages, but do check buy-swap-sell fb groups. So there are often lost or found pets on them, worth putting on Bendigo bss and bss All Trades, as well as even Marong/Maldon/Heathcote groups to find any word-of-mouth sightings that people hear of. Will of course keep a good look out if driving on your side of town - we are way out the other side towards Maryborough. I was hoping there would be good news today. I can't think of anything else to suggest and I hope the media outlets get back to you quickly. I think a news report would probably get more attention than an advertisement but of course, you've got to get someone to agree to run the story. I hope you hear something positive very soon. Please let us know if there is any news. Thankyou for your love and suggestions. Still looking for Agatha. Still no sightings since Tuesday afternoon which makes the Pet Detective think that someone has found Agatha and is keeping her. Doing more door knocking and flyers to try and put pressure on people to hand her in. Still a chance that she is wandering but seeing as though she loves kids and people it is beginning to seem more likely someone has her. 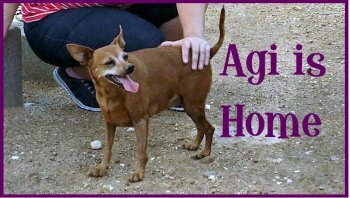 Someone called this afternoon after seeing the ad in the paper and reported seeing Agi yesterday morning along the National Park trail near the Quarry Hill cemetery. We spent the afternoon walking through the area, delivering flyers to letterboxes and door knocking. Family rode their bikes through the park land and even further through National Park area as each of the sightings have been on or near a National Park track. 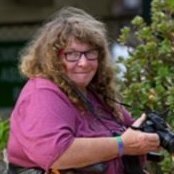 Bendigo is full of bushland amongst residential areas and it seems as though Agi is travelling around the area via the National Parks. People have reported her as being wide eyed, ears tightly pulled back and tail tightly in between legs as she runs away. Agatha usually loves people. She must be stuck in flight mode. So many tears this week We are heading out to explore more of the National Park tracks tomorrow. You know, once she settles ..she may well find home . Upsets can take over 24 hrs to settle down .... and when that adrenaline wears off ... hopefully she can find a drink, and make the right moves to backtrack ! Yes, Strathfieldsaye is the next suburb. I cannot believe that she has been missing for 5 days now We have been taking our other min pin with us searching and getting him to bark and also letting him mark the area. I am so tired. Had a sighting last night near bushland near a Petstock store so spent 4 hours out that way this morning. It was getting too hot so we got in the car and drove around a bit more instead of walking and bike riding. Going to try eat something then head back out. Not sure if she will be lying low today during the hot weather. Will definitely go back through that area when it cools down a bit. Had a sighting last night near bushland near a Petstock store so spent 4 hours out that way this morning. Put some dry food/water together with items that have your scent on them (like old unwashed socks) in areas she's been sighted. The list of things you've done already is brilliant. I'd only add put a pile of kibble at your own front gate. Also put a big poster on your own front fence. People going by tend to be locals & that may jog their memory if they later notice a dog like that. I notice people who've seen her, report she goes into flight mode ears down, tail between legs when seeing people. Tell people, if they sight her, to crouch down on the ground, get low.... even lie on the ground. Friend trying to catch a mini-foxy running loose, lay down on the ground, arms around his head, and made squeaky noises (like a small animal). Curious mini-foxy came back to sniff at his head... and got grabbed. 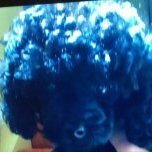 my sons dog went missing. gone for 6 days, did letter box drop and got a phone call , sighted. went out there, now this is a dog I bred, stays with me when they go away for holidays, yet he fled from me. so did the lie down flat as a tack and he stopped running and hid under a shrub. but I had to wiggle on back and tummy to get close enough to catch him he was so stressed out. really strange, once I had his lead on he was all over me like a rash he was so glad to discover it was really me... he sure didn't believe it until he actually had his nose on me? Our little girl is home! She was sighted near the cemetery - this time the call came in 10 minutes after the people spotted her! We headed around that way and got another call from someone who had spotted her a couple of minutes ago. George (my other Min Pin) and I headed on foot while my partner took the car and drove around a different way. Had another sighting from someone who had just seen her. My partner saw her walking through the back of the cemetery and got out the car and called to her and she stopped and looked, hesitated, heard her name being called again and ran over to the car! George and I came up behind them and George ran over to give Agi a lick on the face then he proceeded to jump into the car and into his bed on the backseat! George was tired! It has been the longest week of my life. I am so glad that we didn't give up and kept door knocking and putting posters up in the areas she was sighted - so many people were keeping their eyes out for her that when she emerged she was reported to us straight away. She didn't seem to be very thirsty or hungry, just a bit tender on her legs and feet. We took her to the vet for a check up and she has a slight fever so the vet gave an antibiotic and an anti-inflammatory to help with the soreness in her legs and pads. Agatha came home and went straight to the toy basket to get her favourite toy out!